The 10-minute video, "Process control basics: level measurement," is presented by Control editor-in-chief Paul Studebaker, and is part of its Educational Video Series. It covers the difficulties of sensing levels, application issues, advantages and disadvantages of common technologies, such as mechanical, magnetostrictive, capacitance/RF admittance, ultrasonic, differential pressure, radar and guided wave radar, laser level, nuclear, radar and other methods. This online article, "A dozen ways to measure fluid level," details all the essential level measurement methods, their history, how they've evolved, and more recent innovations. The three main categories include established, hydrostatic and modern technologies. 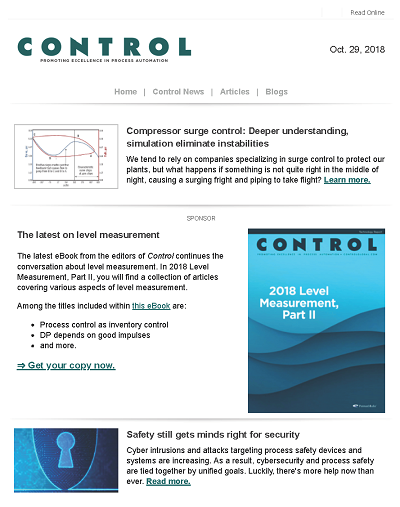 This online article, "Introduction to level measurement," covers float switches, non-contact and contact ultrasonic and capacitance technologies; offers links to applications including storage tanks, cooling towers and life sciences; and gives a list of questions users should answer to pick the right level measurement device. This YouTube playlist of more than 40 short product videos on level measurement technologies begins with "Focusing radar level measurement" and includes handling foam, condensate, buildup and other conditions. Two articles, "Level measurement" by Donald Gillum and "The art of level instrument selection" by Hunter Vegas, cover essential level measurement methods, and how to decide which to specify for particular applications. The 58-minute video, "Basics of Magnetic Level Measurement," by Mike DeLacluyse of Lesman Instrtument Co., and Jim Linahan of Wika, defines magnetic level indicators; shows how they work and how they're used; compares single- and dual-chamber configuration options; covers measurement technology options; and presents sample applications. The 17-minute video, "Ultrasonic level versus guided wave radar level," is presented by Jason Beck of Flo-Corp, who compares and contrasts the pros and cons of these two well-known level measurement technologies. This four-page article, "Thinking caps: understanding capacitance level measurement," shows how to understand and apply capacitance technologies, as well as their advantages and limitations. 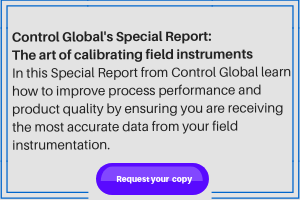 A second article, "Capacitance level measurement," also covers basic principles, and offers a selection guide. This playlist of 43 short, slickly animated product videos on level measurement technologies begins with "Vibronic measuring principle animation" and includes vivid representations of tank gauging, gamma modular, radiometric measurement, time of flight and many other useful principles.